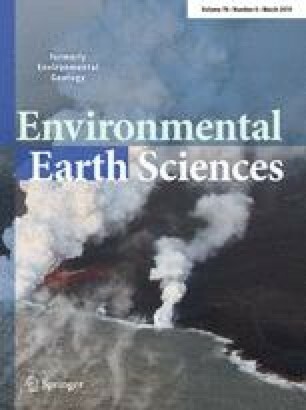 The study investigated the effect of different land use systems on soil physical and chemical properties in Odeda Local Government Area, Ogun State, Nigeria. A total number of nine composite samples were collected each from the sampling locations at three depths (0–10, 10–20 and 20–30 cm) using a soil auger from three different locations; abattoir wastewater area, farmland area, and automobile workshop area. Some physicochemical properties that reflect soil nutrients content and fertility status (Ca2+, Mg2+, Na+, K+, C, N, P, pH, ECEC, particle size, electrical conductivity, and hydrocarbon content) were determined using standard physicochemical techniques. Results from the oil-spill affected (Automobile workshop) and non-oil affected soil were compared. The result shows that land use type affects soil properties differently; bulk density was low in farmland due to the penetration of roots into the soil, but was high at abattoir because of the abattoir effluent on soil that decomposed and reduced the pore space in the soil. The bulk density also high at the mechanic workshop because of the movement of vehicles which vary from light to heavy. Chemical properties like organic matter were more in mechanic village and abattoir than farmland because of the abattoir effluent, which decomposed to increase the organic matter in the soil and the presence of organic compounds from vehicles at mechanic village increased the level of organic matter in the soil. The organic matter was present in large quantity in the farmland, but was reduced by consumption by the plant.